This is almost a flash giveaway – it (should) run one day, until midnight Saturday, eastern time. I say should because I haven’t used rafflecopter in a while – I think I did it right! There will be 5 winners of ARCs for Not Romantic – Charlotte Collins’s story in the Accomplished Ladies collection. Congratulations to Tracey, Jana, Karen, Jules, and Mary! And thank you everyone for entering!! I think Wickham is worse as he was raised to know better. Collins was raised by an illiterate father and may not have had moral guidance. Or, he may have. What do you think? Definitely Wickham. 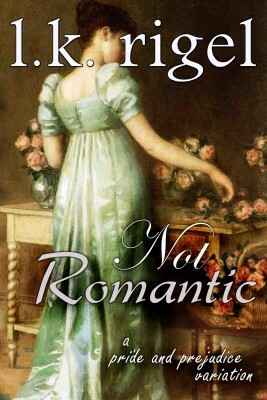 He deliberately went after Georgiana both for her money and to get revenge on Darcy. Then set out to ruin Lydia possibly because he saw that Elizabeth preferred Darcy to himself. Mr. Collins may be stupid, fawning and obsequious but I don’t believe he’s wicked like Wickham. lies, manipulated and uses women and doesn’t care if he ruins them. I can, even while laughing at him, find sympathy for poor Mr. Collins. he had a bad start in life and did the best he could with what he had to work with. I can actually picture him improving through his relationship with Charlotte. Wickham? Such a waste. Every opportunity to become a good human being just HANDED to him and he doesn’t appreciate it. Wickham is definitley worse as he goes out of his way to seduce young ladies for their fortune. Mr. Collins has never done that. Wickham because he is willfully deceptive. Collins is mostly clueless about his behavior and more annoying than wicked. While both characters care for themselves and their interests alone, Collins is simply insensitive and cannot read others. Wickham on the other hand reads others exceedingly well and uses that to improve his own situation. Mr Collins thinks by marrying someone (anyone) he will be improving their situation in life whereas Wickham wishes to marry simply to improve his own situation. This clearly shows to me that Wickham is evil and Collins merely suffers from delusions of grandeur. I too say Wickham – but what great comments! The contrasts and comparisons you all point out are so true. Austen seems to give us paired characters often – two who react differently (for better and for ill) to similar circumstances. I would say Mr. Wickham!! They are both all about themselves, but Wickham is a little more!!! Of course Wickham is worse. He is raised alongside Darcy and given a gentleman’s education and yet he uses people for his own gain. I totally agree that Wickham is wicked. Note the first four letters in both ‘W’ words are the same. I wonder if Jane was playing with us. Anyway, I digress, Wickham has no excuse and had privileges and an education that most, but the wealthy were denied. Collins is just brainless and as such is comedic. I can laugh at his idiocies, but nothing about Wickham makes me laugh. wickham is INTENTIONALLY mean, mr collins is just annoying.. i think he may have aspergers. i dont think mr collins means any harm..
Wickham is by far the meanest……….. I also choose Wickham. He is intentional while Collins is misguided. I always feel that Collins could be encouraged to change for the better while Wickham has had many chances and always chooses thimself over all others. Wykham, definitely. Collins is a dolt, but, as much as he’s able, he is sincere and things matter to him. Wyndham, in the other hand, cares about no one but himself. He is manipulative and narcissistic and uses others with no thought for them whatsoever. Evil, indeed. Wickham is the worst. He knows better yet chooses to do what he should not, thus that makes his behavior worse. Definitely Wickham. His machinations are deliberate. Collins is just an annoying fool. Definitely Wickham, he is very wilfully deceptive! Their equally as bad as each other, just in their unique ways. Collins is slimy, spineless and trys to act superior to others, his actions are to purely better himself in society. Wickham is cunning, and uses his skills to manipulate others for his own gain, both however see women as nothing more then toys to play with and not as intelligent equals. Sorry put wrong name on my last comment… shouldn’t try to read, talk and write at the same time !! Worse? Worse what? Worse creepy little man? Worse womanizer? More slimmy? More manipulative? Arrogant? Evil? More annoying? Bigger idiot? I could go on and on. I have a different one for each of these words. But I must say that overall worse, I will pick Wickham because unlike Collins, who wears his negative qualities on his sleeve, Wickham hides under a false persona. Thank you for the giveaway. For me it is definitely Mr Wicckham. He used women and had absolutely no care aboute what he did to them. I dislike both Collins and Wickham equally… Wickham is just more forthcoming in his wickedness. Wickham would be worst husband, but both are lousy men! Wickham. Collins does not wantonly ruin anyone. He is deluded, about his relationship with Charlotte, but his intentions are honorable. Wickham was not a very nice person, devious and untrustworthy. Wickham – such a cad. Wickhamc cause he uses women. Mr.Collins is the worst. Mr Wickham could be redeemable if he could find a decent woman. Of course she would have to be exceptional. Mr Collins is completely devoid of any goodness, he is smarmy, grasping and a creep. Poor Charlotte will never have the love she deserves. These comments are kicking it. You are all brilliant!! I think Wickham is worse. He is evil, where Collins is just ridiculous! Wickham is just pure evil in my personal opinion! I keep trying to comment and it keeps saying duplicate comment but I don’t see it! Help! Winners! Congratulations – check your email for a notification from me, and to let me know which format you prefer.